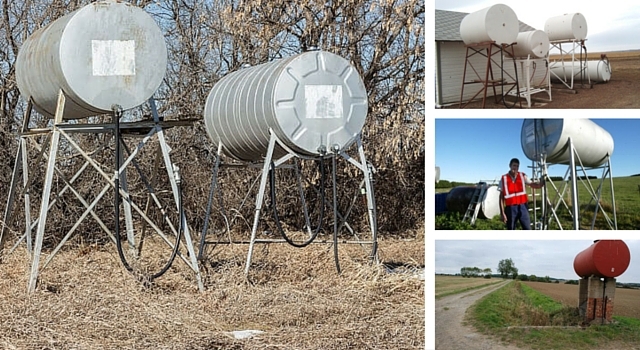 Farm Fuel Tanks - A Guide to Fuel Storage Tanks for Farms. Need to upgrade your farm fuel tanks? Farm Fuel Tanks. What are the options? FUEL storage tanks for farms, they can be as varied as the farms themselves. Similarly, the type of tank you choose will depend on factors including how much fuel you use, the geographic location of your farm, transport – how expensive it is, how regularly tankers deliver to your area, the size of your property and more. We want to give you some insight into the different fuel tanks within the farming and agriculture sector and how they suit different needs. Here are some of the typical options, along with the positives and negatives of each. These are best suited to farms with lower fuel usage, as storage is typically 1250 litres to 2000 litres. In the past many of these tanks were supplied by the oil companies, meaning there was virtually no installation cost. However those days are gone, and the cost of supplying a farm fuel tank now generally falls to the farmer. The good thing about tripod tanks is no electric pumps are needed, because fuel can be dispensed by gravity feed. There’s no need for bunding required because the smaller size tanks falls below environmental legislation for fuel containment. Access for cleaning, checking and refilling has been the major drawback. The tripod structure and security have also been problems. Traditionally tripod tanks were accessed from the top, which made safety when refilling an issue. Because a driver must have three points of contact when refilling a tank, standing on a ladder while holding a nozzle was no longer an option when workplace health and safety regulations were tightened. To solve this problem many farmers had their tanks converted to bottom loading, and at the same time installed gauges in the form of a piece of clear tubing running down the side of the tank which makes it easy to check fuel levels. Tripod safety: Structural integrity of the tank supports needs to be carefully monitored. Tripod stability: Above ground tanks are not ideal in areas prone to severe weather events like cyclones that could topple the tank or cause erosion leading to structural instability. Tripod stands need to be tied down securely in areas prone to high winds. Security: With fuel theft an ongoing issue for farmers all over Australia, security should be a consideration when choosing a tank. The gravity feed on tripod tanks can make it harder to prevent theft given the ease that fuel flows under the gravity feed system. Deterrent options include a lockable ball valve or external security measures like a secured and monitored enclosure. On-ground tanks aren’t limited by a support structure, so space and fuel use are the major limitations on size. Environmental regulations say tanks over 4000 litres need to be protected by some form of bunding in case of leakage or rupture. On-ground tanks can be single wall or self-bunded. They generally take a cylindrical, rectangular or square form. There’s no need to bother with tank stands. Having a larger capacity also means reduced transport costs. With self-bunded tanks there’s no need to spend time and money building a bunding structure. Typically, buying a self-bunded tank works out at about half the cost of using a single-wall tank and building a bund. Fully portable tanks self-bunded tanks are also available in sizes up to 18,000 litres, and can be easily carried to different locations on large properties with the product in them. Security: These tanks also offer a higher level of built-in security. Because they require a pump to dispense the fuel, power to the pump can be switched off when the tank is not in use to stop potential thieves. Tanks can also have a lockable hatch across all access points that can be secured with a heavy padlock when the tank is not in use. Access for cleaning is also simple through built-in man hatches. Single wall on-ground tanks need to be located within a concrete bund that will contain fuel spills. This means extra work and reduces the portability of the tank. The bund also needs to be maintained and drained after rain to ensure it is capable of carrying the tank’s full capacity in case of a spill. A pump will be needed to dispense fuel, and this will need access to either a 12V or 240V power source. These are an economical option for farms that need an on-site storage capacity of 10,000 litres or more. For farms that are storing petroleum, underground tanks can save them big dollars because they reduce the loss of fuel as a result of evaporation – a significant problem when storing petrol above ground. Security: Underground storage virtually eliminates fuel theft. The size of underground tanks also means farms can reduce transport costs. When storing diesel, condensation tends to be a bigger issue in underground tanks. To minimise this problem it’s advisable to run the tanks at a minimum 70-80 per cent of capacity, to minimise the air space above the fuel level. It’s particularly important when storing fuel underground to use a water finding paste once a week, so that water collecting below the fuel can be pumped out. Long term storage of diesel fuel can lead to contamination by microbes of fungal bugs. Fuel treatments such as diesel biocides are also an option to help prolong fuel life. It only takes a quick Google search to reveal there’s a market in second-hand fuel storage tanks, and they’re not always a bad option. We often here of farmers buying second-hand fuel storage tanks from service stations. However, when doing so it’s important to know what’s been stored in it and ensure it is fully cleaned and checked for maintenance issues including rust spots and weaknesses at joins. Fittings can also deteriorate over time leading to fuel loss, so it’s worth checking and changing these as well. Just remember second-hand tanks could be 15-20 years old, so you’ve got a lot to maintain and upgrade to bring them up to standard. When you can get a new 1000-litre self-bunded tank from about $3500 it’s worth considering the new option before making a decision. Hopefully you get an understanding of the types of farm fuel tanks available each with its own pros and cons. As well as that you also get a variety of sizes and configurations for each tank type so it is very much dependent on your personal requirements. With that please get in touch so as we can inform you on a best situation for your needs and get you up and running as soon as possible. Not as simple as giving a price on a straight self bunded ground tank as our tanks need pumping system in place as well. We build out pump systems to suit your requirements. After that give us a call to chat it through.